We are a leading manufacturer, supplier, service provider and exporter of Tensile Fabric Structures that create a mesmerizing visual impact of any architectural form. We also offer reliable services related to installation of these structures. We are a reputed manufacturer, supplier and exporter of high quality Tensile Fabric Structures, which are commonly used in all corporate sectors and exhibitions. Besides, these structures are designed using best grade raw material that is procured from our reliable vendor base. Further, our structures have got huge acceptance all across the globe due to their light weight, high strength, corrosion resistance and durability. 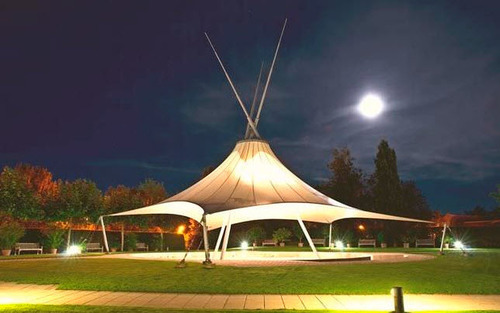 We offer tensile fabric structures that includes custom design-and-build structures, dynamic and 3-dimensional fabric shapes, lightweight stainless steel frame and tensioned stainless steel frame. Also offer services related to installation of these structures.